A1917561. Puppy probably Glaucoma. owner surrender needs help A.S.A.P!!!!! 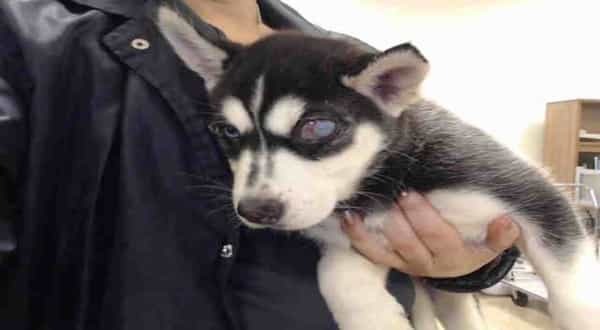 (A1917561) I am a female black and white Siberian Husky. The shelter staff think I am about 8 weeks old and I weigh 14 pounds. So why didn't the lousy owner give the puppy b ack to the breeder, oh my , he probably is the breeder and just turning in the dog because of the eye problem. Stupid is as stupid does!!!! 5 Responses to "Her life is about to end before it ever began, owner surrender 8 weeks old pup, will die unless someone cares"
How sad....this puppy was probably thrilled to have a home & then returned...cruel person! Surgery may be possible. Don't give up on this puppy, please!